No matter how many times I hear this popular story, which is widely circulated and told in many ways, I am reminded about what is important in my life and work: if I solve the big issues first, the small ones will fall into place, but the reverse is not the case. I have found myself working with teams who focus on the pebbles. They stay very busy, counting tactical accomplishments as successes. But at the end of the day, their work begs the question: “Despite all this activity, what does it mean?” I’ve also fallen prey to petty distractions, like sand, that creep into the extra spaces of my life and paralyze me from moving forward. Some sand helps to cement our boulders, but if we let too much fill our jars, we have no room for the BIG things. So what does this have to do with health and innovation? EVERYTHING! Innovation is all about placing bets. 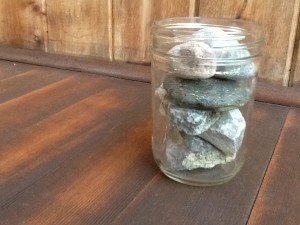 But many innovation teams get paralyzed trying to move the BIG, unwieldy rocks and instead get caught up moving piles of pebbles from one jar to another. Injecting the discipline of asking the “rock, pebbles, sand” question early and often can help teams stay focused on the BIG opportunities. Just because the BIG rocks are heavy, we shouldn’t turn our attention to pebbles and sand. This article bases on balance for your life and how certain things play its roles. For me, my big rocks would be family, health, and happiness. As we move on down, my pebbles would have to be friends, grades, and outside tasks. As we get to the sand, its minor personal things as going out. To balance on how I will spend my time, I plan things out on a calendar and I make sure I can do as much things I can possibly can effectively to benefit myself. Learning to balance everything is important, like your health and school work or job. This story was so very well written, it totally provides an insight to have really is structured. It is also a wakeup call to how many distractions “sand” really take up out daily lives. We should be focusing on our family and health. However most of us seem to prioritize other things in this day and age. Thank you for your very thought- provoking story. When life is constantly challenging us – death of a spouse, loss of a job and financial strains….or all at the same time….it is important to step back and remind of ourselves of our blessings. It is a very powerful story that can teach many life lessons. Thanks for the feedback! I’m going to fix our boat so out daughter can take it out tomorrow. It may feel like a pebble but rewarding her for working 9 days in a row feels like a rock to me! Great reminder, Jean. Thank you! Life and work get so much easier when we stay focused on our “Big Rocks” and don’t mistake activity for progress.